Tag: Anxiety | Sanctuary Counseling, LLC. While reading a bit about anxiety and depression the other day, one thing in particular stuck with me. This reading stressed the importance of acceptance. When we are able to accept our struggles, we are able to work with them rather than against them. This particular reading used a fantastic metaphor to describe the acceptance of anxiety. Anxiety was portrayed as a chimpanzee who scratches at the door of a woman’s house. The woman panics and locks all of the doors and windows in the home for fear that the chimpanzee may hurt her. With each lock that the woman fastens, the chimpanzee grows in strength and size until he is as big as King Kong. The woman realizes that the only way to calm the beast is to open the door. When the door opens, the chimpanzee shrinks to the size of a baby and crawls into the woman’s arms softly. After the chimpanzee realizes that the woman has nothing to give to him and will not fight him, he exits the door and wanders down the street to the next home. Acceptance of our struggles is difficult, but powerful. Perhaps we should think of our struggles as the chimpanzee described above. Think about how when the woman faced her fear and accepted the chimpanzee, he became manageable, and cooperative. Anxiety and depression are much the same. We should all try to recognize that anxiety or depression are not undefeatable monsters, but rather something you can partner with to become a stronger individual. Those of us who experience deep pain are, in my opinion, blessed. We have the opportunity to grow and learn from the pain that we feel. We can use our own experiences to become a better person and to help others who may be struggling. I believe that we see the world differently than most. It is important to remember that no matter what our struggles are, we are not defined by them. Rather than saying “I am depressed” try saying “I feel depressed”. Rather than saying “I am stupid” try saying “I struggle with this sometimes and may need some help”. I say this because we are more than a diagnosis, a medication, or a label. We are made up of so much more than that. We are mothers, artists, athletes, students, or even a friendly face at the market. We should appreciate and accept all the parts that make us a whole because, without them, we would not be the unique creations that each of us are. In conversation the other day, a friend and I were discussing the use of anti-depressants in society. I want to start by saying that there is nothing wrong with taking or being prescribed anti-depressants and helping to find balance within oneself, but there seems to be this growing need especially among young people for a “fix-it” pill. If grades are slipping, if someone isn’t their usual self, or maybe someone is nervous about their future, it’s all too common that medication will be suggested. Many times all we need is to just have some time to sort it all out within ourselves and to know that we are surrounded by safe, loving, and supportive people while we do it. 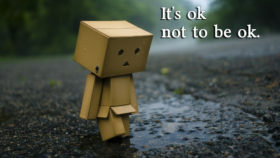 In case you are one of these people who just doesn’t feel ok, please know that IT IS OK NOT TO BE OK! Don’t put yourself in a box, don’t hold it in, don’t feel like you have to run away. We all need to allow ourselves the time and space to be sad, angry, upset, confused, or scared without feeling like that is somehow not allowed. One of the most beautiful things about being human is that we can have these emotions and be completely aware of them. 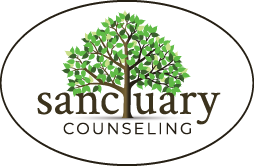 If and when your emotions take a more than usual lasting toll, or bring really negative and uncomfortable thoughts to your mind… talk to someone, reach out, make it known that you are not OK. Come talk to one of our therapists here at Sanctuary Counseling… don’t feel like you have to hide and medicate who you are because others feel uncomfortable about your raw emotions. After all, they are YOUR emotions. Feel them, experience them, address them, and embrace all that makes you, you. Sending love and positive thoughts your way, always.